Moderna Museet. Sculpture After Sculpture: Fritsch/Koons/Ray. Exh. cat., Ostfildern: Hatje Cantz, 2014 [Texts by Jack Bankowsky, Thomas E. Crow, Nicholas Cullinan, Made Great, conversation between Michael Fried, Isabelle Graw, Michelle Kuo, Charles Ray, Scott Rothkopf], inside cover page, p. 23. Fineberg, Jonathan. Art Since 1940: Strategies of Being. 3rd ed., New York, 2010, p. 459, illustrated in color. Naumann, Francis M. Jeff Koons: New Paintings. New York: Base Design, Gagosian Gallery, 2010, p. 4, illustrated in color. "Design & Society." Studio: Israeli Art Magazine, August - September 2008, p. 18, illustrated in color. Holzwarth, Hans Werner, ed. Jeff Koons. Cologne, 2008, p. 121, illustrated in color. Bankowsky, Jack, Jeff Wall, Alison Gingeras, Thomas Crow, Diedrich Diedrichsen, Tim Griffin, Stephen Prima, & Rhonda Lieberman. “Pop After Pop: A Roundtable.” ARTFORUM, October 2004, p. 175. Deutsche Guggenheim. Jeff Koons: Easyfun-Etheral. Exh. cat., Berlin, 2000, p. 29, illustrated in color. Jorg-Uwe, Albig. "Jeff Koons, ein Prophet der inneren Leere." Art, December 1992, p. 5, illustrated. Koons, Jeff. The Jeff Koons Handbook. London: Anthony d'Offay Gallery, 1992, p. 48, illustrated and p. 151 (listed). Muthesius, Angelika, ed. Jeff Koons. 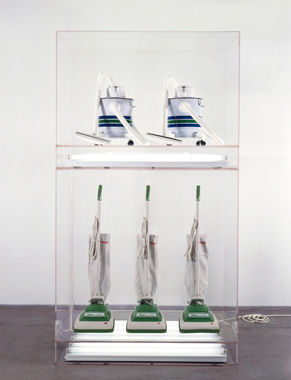 Cologne, 1992, p. 48, 50 (installation view: Weinberg Gallery, Los Angeles), illustrated in color.